This is the framework most commonly used to guide analysis of any firm’s strengths and weaknesses. 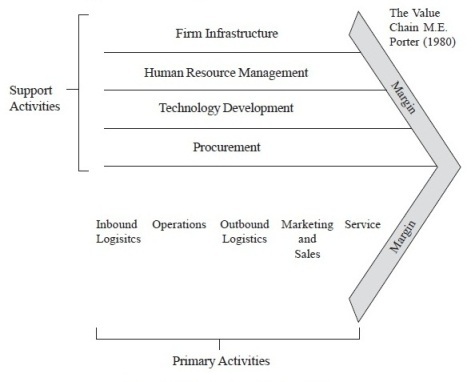 In this framework, any business is seen as a number of linked activities, each producing value for the customer. By creating additional value, the firm may charge more or is able to deliver same value at a lower cost, either of this leading to a higher profit margin. This ultimately adds to the organization’s financial performance. distributing the inputs to the product or service. They include materials handling, stock control, transport etc. b) Operations Transform these various inputs into the final product or service – machining, packaging, assembly testing etc. c) Outbound Logistics collect, store and distribute the product to customers. For tangible products this would be warehousing, materials handling, transportation etc. In the case of services they may be more concerned with arrangements for bringing customers to the service if it is a fixed location (e.g. entertainment show). d) Marketing and Sales makes consumers/ users aware of the product or service so that they are able to purchase it. This includes sales administration, advertising, selling and so on. e) Services activities helps improving the effectiveness or efficiency of primary activities. a) Procurement: This is a process for acquiring the various resource inputs to the primary activities and this is present in many parts of the organization. b) Technology Development: There are key technologies attached to different activities which may be directly linked with the product or with processes or with resource inputs. c) Human Resource Management: This is an area involved with recruiting, managing, training, developing and rewarding people within the organization. This categorization of the activities as primary or support may be found true for organizations in general, however it is always better to have one’s own judgment in identifying activities for particular firms in consideration. With the indicative guiding points, we have realized how with the Value Chain Framework, organizations can use these indicators as a reference point in order to improve its overall ability to create value. Miller suggests that the value chain framework can also be useful in a broader sense while deciding in what and where to specialize in the value activities from product design to the delivery of the final product or service to the final consumer.